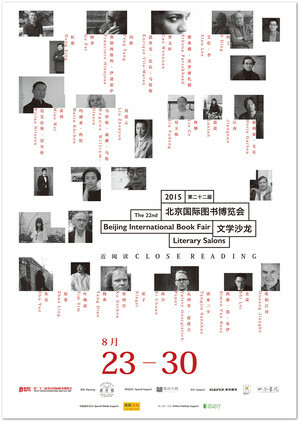 In 2015, the Beijing International Book Fair, for many years China's most important publishing event, expanded into a small literary festival this year, with event planning by Paper Republic. Below is a small overview of last year's festival events. The full schedule is below. Simon Van Booy conducts a writing seminar for a select group of aspiring Chinese-language writers. Part workshop, part lecture, the event is aimed at introducing young Chinese writers to the Western-style creative writing teaching process. A few attendees will have short pieces translated for Van Booy to read in advance; other attendees are welcome to participate in the discussion. Simon Van Booy presents his newest novel to appear in Chinese: The Illusion of Separateness, a tour-de-force historical tapestry spanning nearly a century of history. Rooted in WWII France, the story reaches out to embrace six main characters in different times and different places, patiently filling in colors and lines, with language of chilling beauty, until their apparently disparate lives and fates are shown to be deeply connected. Van Booy speaks on the craft of narrative construction, and on the creation of his style. Magazines are often on the front lines of culture: reflecting on current events, exploring new topics, driving society forward. They’re often at the forefront of cross-cultural communication, as well, providing a venue for readers to explore writing and thinking from other countries. 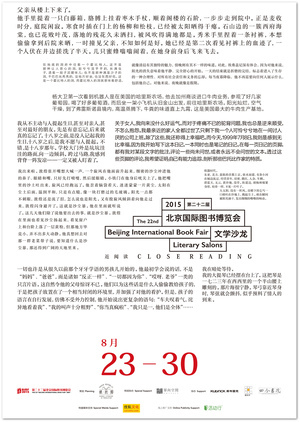 This event brings together two such magazines: the UK’s Granta magazine, which has been published in Chinese by Shanghai 99 Readers since 2012, and Pathlight, an English-language journal of Chinese literature produced by People's Literature Magazine and Paper Republic. Editors Peng Lun and David Haysom discuss how their publications navigate the cross-cultural divide, and why it’s important to hear the latest voices from the other side. Renowned Chinese children’s author Cao Wenxuan leads a group of Chinese winners of the Bronze and Sunflower children’s literature prize in conversation with Francisco Hinojosa, one of Mexico’s most influential authors of children’s literature. The two will discuss creative innovation and breakthroughs in writing, and the cultivation of new powers in children’s literature. Famous illustrator and Oscar-winner Alan Lee shares his experiences participating in the creation of The Lord of the Rings and The Hobbit films, from his earliest illustrations, to the visualizations of the film, to the production process. His talk will be accompanied by a display of his original illustrations. Through Lee’s narration, art, and the new Chinese publication of his The Lord of the Rings Sketchbook, audiences will gain a unique window into Tolkien’s world. Writers from disparate nations and cultures meet to discuss the nature of literary communication and exchange between countries. From their diverse points of view – as authors, editors, and translators – they share their experiences and observations on the ways in which literature cross national boundaries, and how cross-cultural favorites are discovered and turned into classics. Enrique Vila-Matas, one of Spain’s most prominent novelists and a frequently-mentioned contender for the Nobel Prize in literature, has had four novels translated into Chinese. 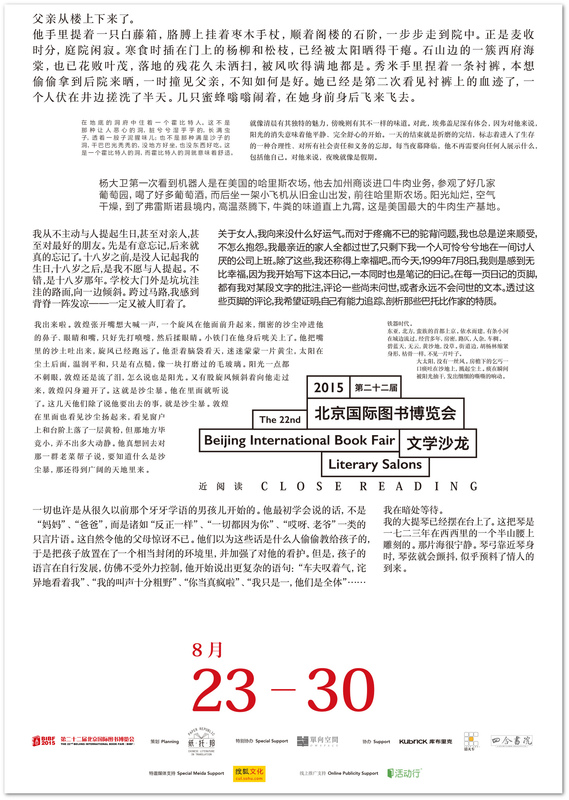 Today he introduces his two most recent publications, Bartleby and Co and Dublinesque, to his Chinese readers. Alan Lee, British illustrator and film art director, is best known for his work on Tolkien’s Lord of the Rings series, as well as art direction on the films made from the books. Lee’s The Lord of the Rings Sketchbook is a record of his creative process as he developed the visual imagery for the books and films, collecting the various sketches produced as he created Tolkein’s world of Middle Earth. Fans of The Lord of the Rings and The Hobbit won’t want to miss this! The 21st century has been a time of potent literary cross-fertilization between languages and cultures. In some cases this has led to a broader dialogue; in other cases the communication has been more one-way. What has led to the creation of an “international literary community” in the West? 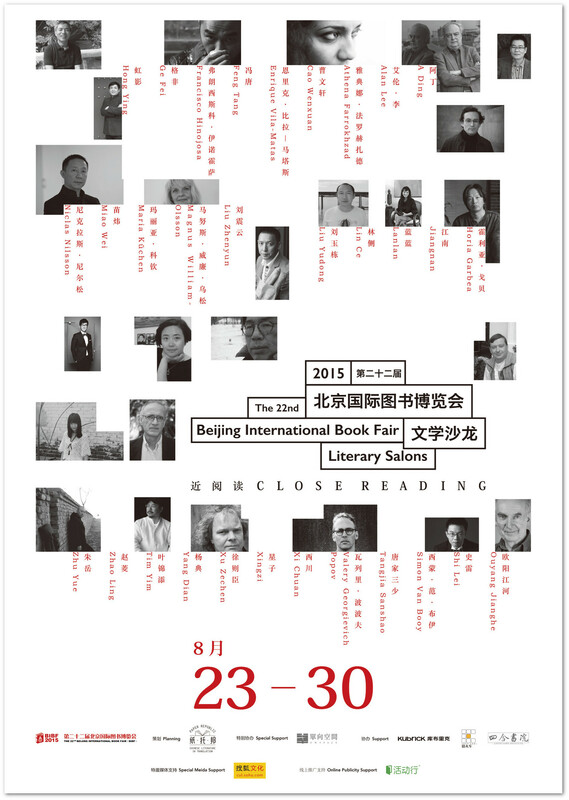 How has Chinese literature participated in this movement? Tonight, authors Enrique Vila-Matas and Liu Zhenyun are joined by translator and scholar of Spanish literature Fan Ye in a discussion of cross-border conversations. Scandinavia has a rich poetical tradition, one that, through the works of Harry Martinson, Tomas Tranströmer, Edith Södergran and others, has provided powerful inspiration for the development of contemporary Chinese poetry. The BIBF Poetry Night will bring five Chinese poets and four Swedish poets into dialogue with each other, to recite and sing in their native tongues, and enjoy an evening of pure poetic communication. In a conversation ranging from visual art, to costume design, to film production, two Oscar-winning art directors discuss their visual medium from quite different angles. Alan Lee, renowned book illustrator and creator of the Lord of the Rings’ visual style, is steeped in traditional Western mythology. Tim Yip, costume designer and art director for Crouching Tiger, Hidden Dragon, among many other films, is an ambassador of the Eastern aesthetic. Hear them discuss how they arrived at their particular styles in today’s event. Today we invite two of China’s most influential fantasy authors, Jiang Nan and Tangjia Sanshao, to share with the audience the unique course of their careers, from their earliest experimentations with fiction, to their eventual dominance of the best-seller lists. Along with the discussion of their characters’ struggles and adventures, and their thoughts on life, love, and death, these two authors will select passages from the other’s work, and engage in an in-depth text-based discussion of the process of fictional creation. They will also choose favorite passages from their own work to share with the audience. Tonight’s conversation brings together two literary giants – Spanish author Enrique Vila-Matas and Chinese novelist Ge Fei – in discussion of each others’ works. Both authors, ostensibly “writers’ writers” known for their intellectual depth and breadth of reading, are also superb storytellers, and human observers of great humor and compassion. They’ll be talking about Vila-Matas’ Bartleby and Co, and Ge Fei’s The Invisibility Cloak. As the forms and channels of publishing diversify, and the internet becomes more and more crucial for publicity and distribution, young Chinese writers have more choices for venues for writing and publication. In addition to magazines, there are now apps and dedicated literary WeChat channels, and in addition to literary publishing houses, there are now digital publishing platforms, e-readers, and even self-publishing. For this event we invite A Ding, novelist and creator of the “Guoren Fiction”“ app, the Douban Read editor Yin Dan, and Zhu Yue, author and editor, to discuss how the internet age has changed how they approach writing, publishing, and promotion. From the moment he began publishing, Feng Tang has been one of the most-watched young writers in China. This year, as the film of one of his first books, Everything Grows, appears in cinemas, his sixth novel, No Woman No Cry, has been published inside China. This event is an opportunity for Feng Tang’s fans to interact with him in a more intimate setting: we’ll invite readers to write short reviews of No Woman No Cry, and select thirty of the reviewers to attend this “Review Salon”, and have a conversation with Feng Tang about his novel. Alistair MacLeod, a Canadian master of the short story, passed away last year; Nobel laureate Alice Munro once said of him: “It’s hard to think of anyone else who can cast a spell the way Alistair MacLeod can.” Two of MacLeod’s collections, The Lost Salt Gift of Blood and No Great Mischief, were published in Chinese earlier this year. The Canadian embassy will screen a documentary about this national literary treasure, bringing Chinese readers one step closer to MacLeod’s unique aesthetic world. Nearly twenty years have passed between Hong Ying’s Daughter of the River and Miao Wei’s There Will be Bread, twenty years in which the starving daughter of Hong Ying’s semi-autobiographical novel has been replaced by the overfed gourmands of Miao Wei’s idiosyncratic stories. Hunger, one of the great human passions, has always had an important place in literature, but Miao Wei’s thematic approach feels like something new. Hong Ying, novelist and influential food critic, sits down with him to discuss this new flavor of literature.